Posted in: Games, Guild Wars 2, MMOs, Opinion. I’ve recently been playing the Heart of Thorns expansion for Guild Wars 2. I resisted it for a while. $50 seems like a lot to pay based on all the money I’ve already spent to buy and upgrade the original game. I think that Arena Net could have given the expansion away and made it up in in-game purchases that folks would purchase, or at least have priced it at $29, which would have been a no-brainer purchase price. But regardless of that, I now have the expansion and I’ve played it enough to recommend it, with a provisio. Don’t try to Solo the new content. It apparently is designed for groups only. And not even one friend is enough. Join a Guild. It is best to run with a half dozen to a dozen folks to get the full experience and avoid the heart break of being left alone in the jungle. The Maguuma Jungle is a very nasty place with groups of powerful Veteran bosses just around every corner. Let’s start with a look at some of the new content. You will need to get Mastery Points, both in “Central Tyria” and in Heart of Thorns to progress your character and take advantage of new abilities and the new Elite Specialization for your class. You can check the wiki for full descriptions of those, but I can give you a quick overview of what I’ve learned about getting those Mastery Points. I tried several ways to get Mastery Points for Central Tyria since I wanted the benefits of Pact Commander as soon as possible. Fractal and Legendary Crafting were of no interest to me. I intend to stay with Exotic gear rather than grinding for Legendary Weapons and Ascended Armor. And carefully following the Youtube video guide for this one, it took about 1/2 a day to get this achievement. At one point you are killing the last 6 crabs in the Sharksmaul Jumping Puzzle and I fell and died and lost the rifle and had to spend 20 minutes getting back through the puzzle to the place to get the last two crabs. 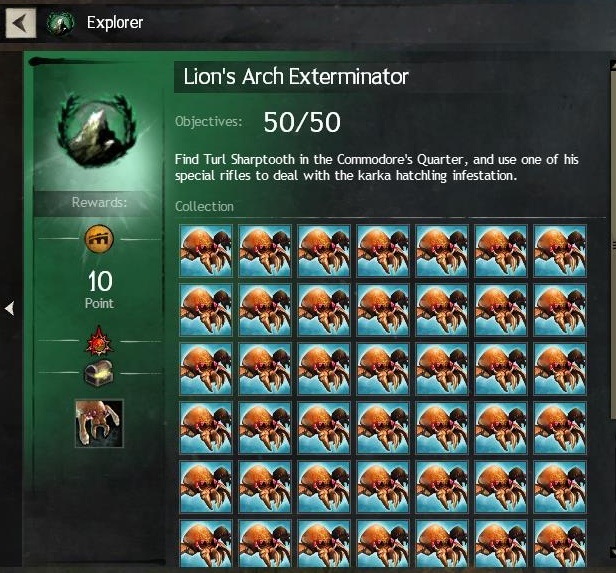 I also tried the Diving Master achievement which has you diving off about 20 places in Tyria. The problem with this one is that the final two are in Jumping Puzzles and after 1/2 a day trying and dying on the pipes below, I was never able to complete the Not So Hidden puzzle in Genarran Fields. Unless you just love this type of Achievement, I suggest doing the Season 2 story line. Each section of the story gives you a mastery point without trying to do the obscure or harder achievements. You will need help for about a third of the story quests. Another reason to join a friendly and helpful guild. Based on my bad experience grinding Central Tyria Mastery points I was not hopeful about getting Masteries in Heart of Thorns, but that’s a completely different story actually. After joining a friendly guild, a few of us jumped on TeamSpeak and went off to tour the Mastery and Hero Points of Heart of Thorns. Since I had only started the area, we started in the Guild Hall, more on that later, and then they helped me with Mesmer ports where I could not travel without Jumping Mushrooms and Ley Line Gliding. But I quickly got up-drafting in Gliding and most of Jumping Mushrooms and opened up most of a new map in the new content. Another thing I found out was that Hero Points are given 10 at a time in the new content. Of course, you better bring friends because you need to kill a champion and a few of his veteran friends to get the point. But with 6 or more friends it’s not a problem. Important tip. If there’s a little Plus Sign on the marker for the Hero Point, then it spawns something dangerous. So wait until your friends show up. No plus sign? Then go for it. Also, and this is very confusing. Hero Points in the new content are like everything else – If they are filled in, then they are earned. In “Central Tyria” if the hero points are filled in then they need to be earned. I’m not clear on why this obvious inconsistency remains. Guild Halls are huge in Heart of Thorns. 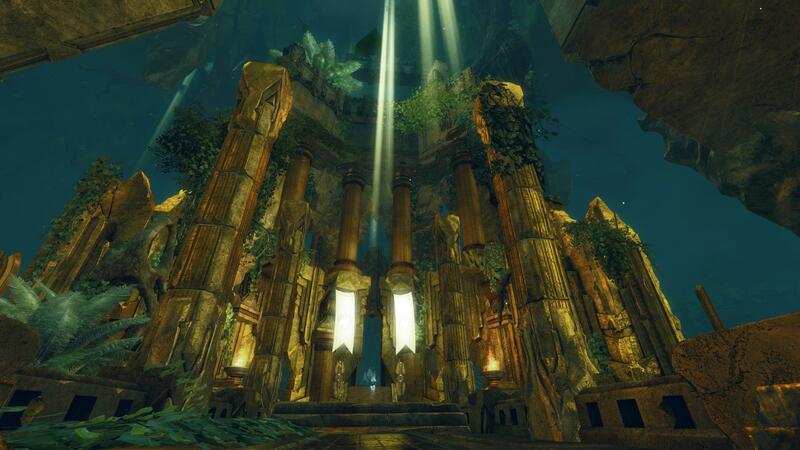 The tiny cramped and exclusive guild halls in Tera are paltry compared with the City Sized halls in GW2. Notice that the guild hall is about 1/2 the size of a map. I need to talk to my guildies about the services tho. I find a guild bank, but no normal bank or trading post. Seems like we need those as soon as we can. There are only two styles of guild halls, but any guild can have a guild hall. You don’t have to be ranked. You just need to take and defend the hall against the monsters of the Maguuma Jungle to have a guild hall. I suggest you find a friendly guild, that uses Teamspeak or other audio chat software and then experience the Heart of Thorns Expansion.